I would like you to assume personally the initiative and central responsibility within the Government for the development of a program of substantive cooperation with the Soviet Union in the field of outer space, including the development of specific technical proposals. I assume that you will work closely with the Department of State and other agencies as appropriate. 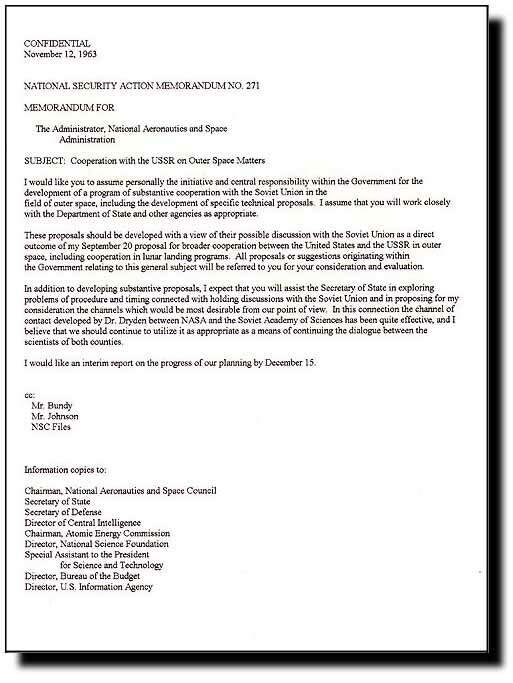 These proposals should be developed with a view of their possible discussion with the Soviet Union as a direct outcome of my September 20 proposal for broader cooperation between the United States and the USSR in outer space, including cooperation in lunar landing programs. All proposals or suggestions originating within the Government relating to this general subject will be referred to you for your consideration and evaluation. In addition to developing substantive proposals, I expect that you will assist the Secretary of State in exploring problems of procedure and timing connected with holding discussions with the Soviet Union and in proposing for my consideration the channels which would be most desirable from our point of view. In this connection the channel of contact developed by Dr. Dryden between NASA and the Soviet Academy of Sciences has been quite effective, and I believe that we should continue to utilize it as appropriate as a means of continuing the dialogue between the scientists of both counties. I would like an interim report on the progress of our planning by December 15.